On 08th Oct 11, Peter O Reilly, John O Hanlon, John Lowery, Terry Whiteside and Kevin Pollard will land in Malta and on Sunday for a whole week they will be learning and honing their skills, whilst taking in the 29 degree water temperature as they dive the fantastic deep wrecks and underground passages that Malta has on offer. All the divers will undertake personal instruction in the techniques required to add helium to the breathing gas, whilst using their CCR units. (MOD II). Consequential use of helium in the breathing gas, like as in Open Circuit diving, will reduce the narcotic effect as depth increases. Upon successful completion of the course, this will enable the divers to dive to depths of 60 mtrs. On 26th November 11, four more club divers, David Hankin, Paul Vint, Niall Gonelly & Peter Graham will join Paul Toomer in Malta for the commencement of their Open Circuit Normoxic Trimix. This course, like the The MOD II course, this course also will introduce Helium to the breathing gas in order to lower the effects of narcosis as the divers dive to deeper depths. The divers will receive the necessary skills during their week long intensive course that will enable them to dive safely to depths of 60 mtrs and by carrying out the strict decompression obligations, return safely to the surface. On 03rd December, Gerry Brown, Jimmy Lyons and Frank McDermott will also venture to Matrix, where they will undertake the pinnacle of CCR Training (MODIII) This is the ultimate level of training and requires particular skill and mindset to safely descend to 100+ meters and return safely to the surface, making full use Team Type Diving. The accommodation has been gratefully provided by The Topaz 4* Hotel in St Pauls Bay (0035623516202) @ 12E per night bed and breakfast. Flights by Easyjet, from Belfast @ £120 return. In the event that any additional people would be interested in travelling to Malta, there will be ample opportunities to take in some regular Open Circuit or Closed Circuit diving. For further information, please call Peter McCamley on 07836774694 and it will be sorted. Trip to Malta - 11 divers are heading to Malta on 2nd April 2011 6 of whom will be rebreather Inspiration divers doing MOD 2 with Paul Toomer and Alan Wright of Matrix Diving. 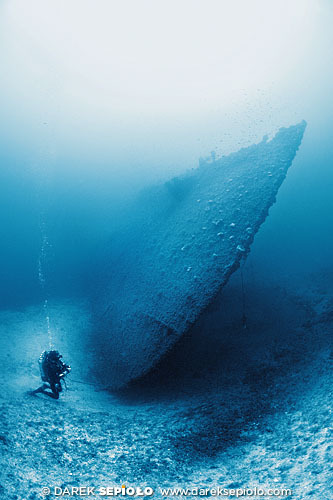 All eleven will be diving the wrecks of Malta from 30 to 50 mtrs over the first 3 days. Then the MOD 2 divers will be doing the second world war Sub HMS Stubborn @ 58 mtrs and The Polynesia (above) @ 66 mtrs...See net for details. The rest of the divers will be diving with MaltAqua.